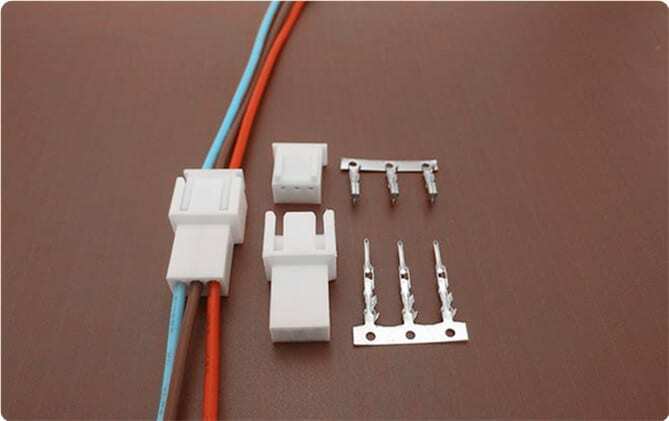 SCT2508 Series are compatible Molex Mini-Latch 2.5mm pitch wire to wire connectors. Scondar offers SCT2508 Series as replacement and cheaper alternative of Molex 2.5mm pitch wire-to-wire connector in a complete package including the male housing, female/receptacle housing, female terminal and male terminal, all manufactured with precision-fitting and durability ensuring accurate mating. Mini-Lock 2.5mm pitch can be applicable for both wire-to-board and wire-to-wire applications. Stand-out features of this connector include TPA, positive-lock and glow wire, meet varying industry needs. In addition, mini-lock has a securing feature that ensures right mating orientation, and the positive lock that provides an audible click for contact assurance. The four-point contact design is good for electrical reliability of the connector while the pull tabs assist in unmating. Intendedly manufactured for combining both flexibility and reliability, the 2.5mm pitch wire-to-wire connectors are equipped with a friction lock and crimped-style lock mechanism for safe fastening and removal of the wires from the board. Manufactured with higher infill housing, the 2.5mm connector is suitable for high density and crowded applications, withstanding higher strain and mechanical stress. The Molex Mini-Latch 2.5mm pitch wire-to-wire connector features a wide-beveled shrouded header that assists in preventing cable connection mishaps and providing guidance for the mating connector. This special feature of the Mini-Latch helps protect the wires during harness assembly. You can expect that your wire-to-wire connector package is undisturbed during the trip and has maintained its vitality even during your production stages, which is why a lot of our customers has raved about our product for both cheaply-priced and, at the same time, resembles the Molex Mini-Latch 2.5mm pitch wire-to-wire product.